Warning: this post contains contextually relevant toilet humour gags the author was unable to resist. One of my first bosses in B2B Marketing told me why she had chosen to pursue a career in B2B as opposed to the (at the time) more glamorous world of FMCG Marketing “I didn’t find the idea of marketing nappies or tampax that challenging or interesting”. Admittedly, there’s only so much you can do with loo roll (literally and creatively) – especially one that’s been market leader since 1961 according to the Superbrands Annual 2012. But there’s a reason for that. I may be an old-fashioned prude, but behind closed doors up and down the country, how we wipe our backside is our business. A staggering 14,728 people voted, although it is not clear how many others spoiled their paper. Perhaps I’m missing the point and all will be revealed in a forthcoming awards submission for Andrex which will show results that during the campaign, the PCEI rose by 243% (Paper:Cheek Engagement Index – a standard measure across the industry). Or maybe it was a test marketing exercise to feed into the new product development process? Was Andrex about to launch “pre scrunched” Andrex, one wonders, and have these landslide results flushed that idea down the pan. I know it’s not possible to stick to the classic “soft, strong and very very long” for every campaign, but loo roll is loo roll. Use the full marketing mix to innovate and tell me about the features that make Andrex superior to the competition. I don’t need selling on the ‘benefits’ and certainly don’t want to segment myself as a ‘scruncher’ or ‘folder’ as some sort of lifestyle statement with deep emotional engagement to the brand! All of this reinforces that, like my boss all those years ago, I am very, very happy to have spent the last 15 years as a B2B Marketer. But how about you? Do you love or loathe this campaign? Does it make you proud to be a B2B or FMCG marketer? I’d love to hear your thoughts (about this campaign, not your toilet preferences please). 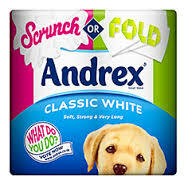 This entry was posted in Case Studies, Just for fun, Marketing and tagged Andrex, Andrex scrunch or fold, campaigns, creativity, engagement, marketing case study on April 9, 2013 by Steve Revill.